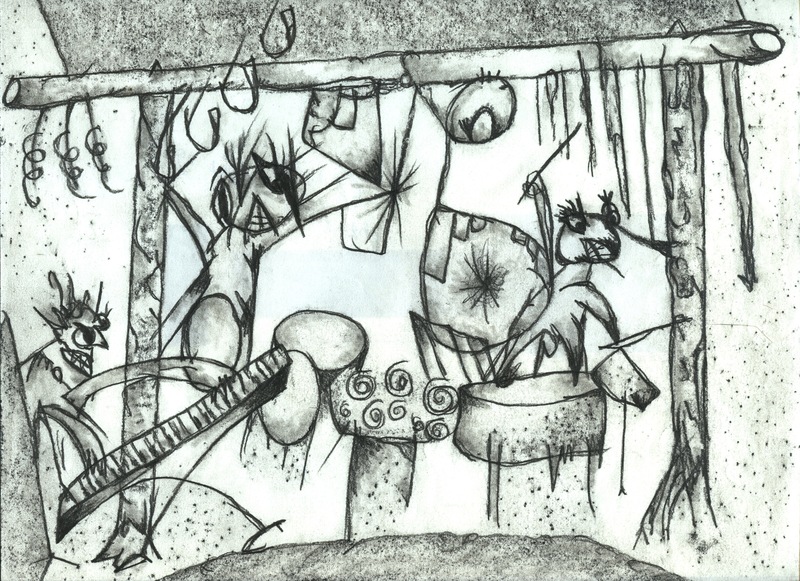 Alloy Orchestra Smites Again – frottage/scrawl drawing by Roger Miller. Left to Right: Roger Miller, Terry Donahue, Ken Winokur. 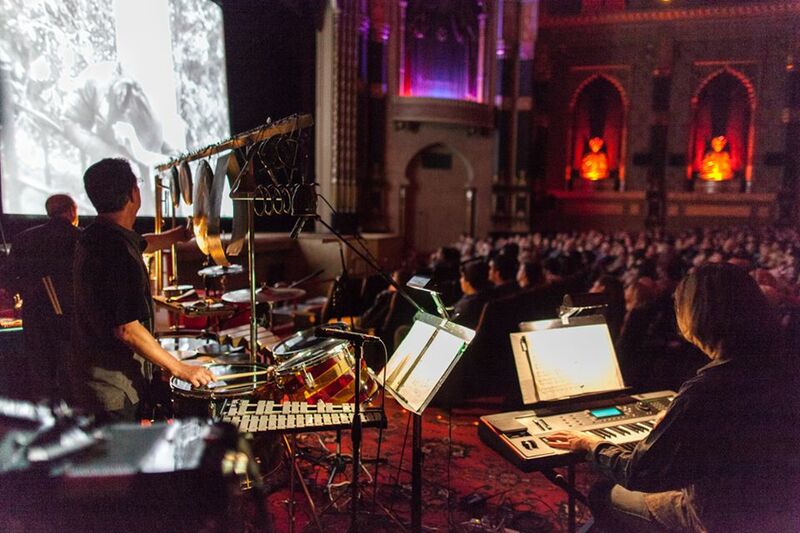 Alloy Orchestra at the Milwaukee Film Festival, 2014. During their fall 2013 tour, the group was recorded live in performance in Nashville for THIRD MAN RECORDS (Frank Black’s label). The film was MAN WITH THE MOVIE CAMERA, one of the Alloy’s most rambunctious. This has now been pressed as a double LP, vinyl. For sale on tour and soon on the web site store! 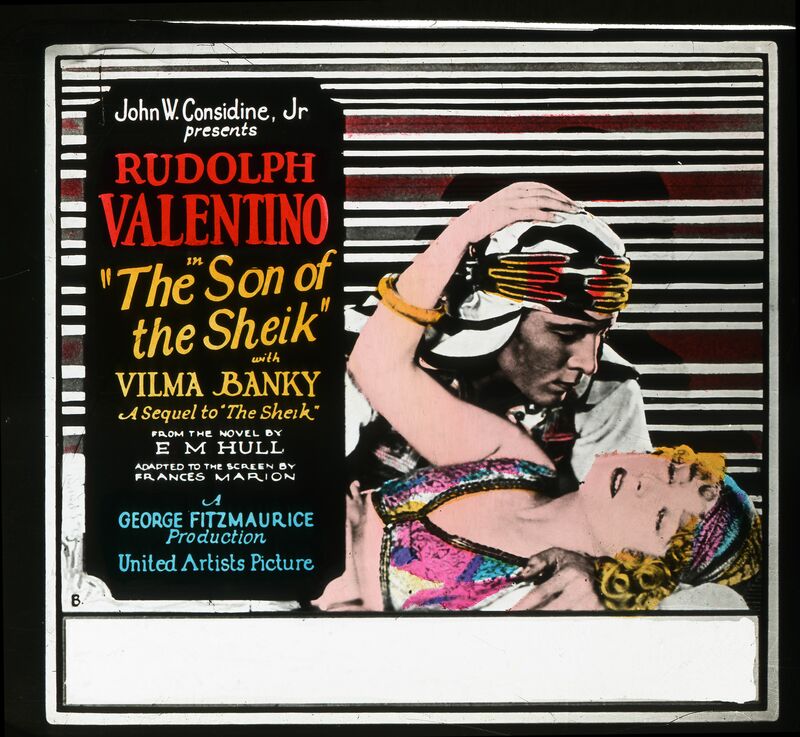 Original Poster for Son of the Sheik. Many, many other films remain in their repertoire. The Alloy Orchestra is a silent film accompanying group. Roger (pictured above on left) joined on keyboard in 1997. Terry Donahue (middle) remains on percussion and accordion (he played in No Man), and Ken Winokur (right) remains on percussion and clarinet (he played on Roger Miller’s Exquisite Corpse, No Man’s Band, and others). The group features a rack of “junk percussion” along with Roger’s orchestral keyboards. Every summer they score a new film which becomes their primary film for that year. However, they keep their past films in repertoire, which includes METROPOLIS, THE GENERAL (Buster Keaton), NOSFERATU, MAN WITH A MOVIE CAMERA, PHANTOM OF THE OPERA, etc. The Alloy Orchestra Web Site has an extensive tour schedule, a store (we have many silent-era movies on DVD that we have scored – Turner Classic Movies often shows Buster Keatons’ THE GENERAL with our score playing), and much more information. The Phantom of the Opera (starring “The Man of a Thousand Faces”, Lon Chaney) was released by Image Entertainment on Blu-Ray only. and I thought I’d shoot it your way to see what you thought. if you’ve got the time. I LOVE Alloy Orchestra. When I first heard of this group I was just in love, I thought, this is exactly the kind of thing I would love to do! I love old films and often enjoy the music to them, the idea of composing and performing music to films is really exciting to me, and though I haven’t really done it yet, I think that I would really enjoy it. Anyways I just wanted to say THANK YOU for doing what you are doing, it’s just sweet. I am a musician and I also work as an AV technician for U of M, and I will be screening the film “Man With The Movie Camera” in for a class this week, it is the version with Alloy Orchestra’s soundtrack, it’s awesome! I’m just checking it out now! Cool. Thanx for checking it out.